A sneak peek at the upcoming Microsoft Worldwide Partner Conference in Denver, the channel's biggest networking opportunity of the year. What happens at the Microsoft Worldwide Partner Conference (WPC) doesn't stay at the Worldwide Partner Conference. Just ask Angel L. Pérez. A few years ago, Pérez met a California-based government solutions provider at the WPC, and was able to lead with that company's solution to land a $3 million deal with a government agency back home in Puerto Rico. "Other than the partner conference, it's difficult to establish relationships with companies," says Pérez, general manager of Rock Solid Technologies Inc., a Gold Certified Partner in San Juan. "Every year we do a different [partnership with another Microsoft partner]. The partner conference has been very successful for us." Those kinds of networking opportunities came up again and again in Redmond Channel Partner magazine interviews with about a dozen partners on their reasons for attending Microsoft's fifth annual WPC, which runs July 10-12 in Denver. The conference has grown fairly steadily from its October 2003 start with 5,500 partners in New Orleans. Last year's show drew 7,000 partner attendees from 3,500 companies and 88 countries to Boston. Gathering all those people under an official Microsoft umbrella makes it much easier to identify and act on new business opportunities, according to partners. "WPC is the most important partner event in each fiscal year," says John Payes, director of the Microsoft Global Alliance for Montreal-based Nakisa Inc., who plans to attend for the fourth consecutive time. "It provides a great forum to foster new partner-to-partner relationships and explore new business opportunities in many jurisdictions around the world," says Payes, who's also president of the Canadian chapter of the International Association of Microsoft Certified Partners (IAMCP). This year's WPC agenda includes a few items of particularly high interest. Robert Deshaies, vice president of Microsoft's U.S. Partner Group, says partners can expect to learn about evolutionary changes to the Microsoft Partner Program and hear more about how partners will fit into Microsoft's "Software Plus Services" strategy, which is Redmond's terminology for Software as a Service. While those will probably be the show's headline-grabbing topics, you can also expect a continued emphasis on Microsoft's "People Ready" campaigns, a lot of information about new releases coming out in the next 18 months, such as Windows "Longhorn" Server, and updated details on the company's marketing and branding plans. Allison Watson, corporate vice president of the Worldwide Partner Group, will emcee the event again, introducing speakers and providing a wrap-up keynote. As Microsoft's channel chief, Watson is likely to be the one to give the details of any major changes to the Microsoft Partner Program. CEO Steve Ballmer will deliver the headline keynote, as he has for every Microsoft Worldwide Partner Conference dating back to the first event in 2003. Will Ballmer be able to give partners the direction they need to understand, adjust to and execute on Microsoft's Software Plus Services spin on SaaS? COO Kevin Turner gave the feistiest keynote at last year's WPC, with several memorable quips, including one about not letting Google eat Microsoft's lunch. He'll speak again this year on the event's closing day. Senior Vice President Rick Devenuti soothed partner concerns about Redmond's consulting and services business with his keynote last year, but now Devenuti is retired. Will Maria Martinez, the new corporate vice president for Worldwide Services, chart the same path? Getting a brain dump from Microsoft on its roadmaps and marketing plans is a strong secondary draw for many attendees. "Hopefully, what Microsoft will release at the WPC this year will be similar to what [it] releases every year relative to business plans, roadmaps and partner programs," says Rand Morimoto, president of Convergent Computing, a Gold Certified Partner based in Oakland, Calif. "In a short three-day period, we learn more about the go-to-market initiatives, the upcoming products and technologies, and the role partners will play in the Microsoft ecosystem. The more knowledgeable we are, the better we can hit the ground running with the local district," Morimoto says. His company will send four people to the WPC this year. Personal contact with Microsoft employees is also high on the list of reasons to participate in the show, says Douglas G. Hafford, vice president of consulting services with Afinety Inc., a Gold Certified Partner based in Los Angeles. "These personal contacts can improve dramatically the level of communication between ourselves and the Microsoft team," Hafford says. "Once you've met, it's much easier to understand the motivations and needs of the other person and both cooperation and response improves." Much of the conference's structure is unchanged from last year's event in Boston. There were about 160 conference sessions in 2006 compared with a planned 150 sessions this year. Like last year, Microsoft is keeping the session tracks aligned to the 13 Microsoft Partner Program competencies with two additional tracks -- one on sales and marketing and the other on business leadership. Individual sessions are scheduled for unveiling in late May. Microsoft will again offer hands-on labs, this time under two main headings: Business Value and Technical. To enhance those all-important networking opportunities, Microsoft will once again offer the WPC Connect online tool, known last year as "Rio," for scheduling and tracking appointments. The company says Rio was used to schedule more than 10,000 meetings at the 2006 conference. The tool should get heavy usage again this year; the conference is expected to attract about 10,000 partners, industry experts, speakers, exhibitors, Microsoft executives and other attendees. The Microsoft speaker lineup also closely resembles that of the 2006 Boston show, with only a few minor name and title changes. CEO Steve Ballmer delivers the main keynote this year, as he has at every WPC since October 2003, when Microsoft combined the Fusion general partner event and the Stampede partner event, which was focused on Microsoft Business Solutions partners. Allison Watson, corporate vice president of the Microsoft Worldwide Partner Group, will also reprise last year's role as event emcee with her own keynote on the show's final day. COO Kevin Turner will also be back after delivering his first WPC keynote last year. Other returning speakers include Corporate Vice Presidents Simon Witts of the Enterprise and Partner Group, Tami Reller of the Microsoft Business Solutions Group, Andy Lees of the Server and Tools Marketing and Solutions Group, Mike Sievert of Windows Product Marketing, Chris Capossela of the Microsoft Business Division Product Management Group and Sanjay Parthasarathy of the Developer and Platform Evangelism Group. Also returning to speak is Steve Guggenheim, vice president of the Worldwide Small Business and Business Operations for the Small and Midmarket Solutions and Partners Group. The only 2006 keynoters who aren't returning this year are Satya Nadella, who moved from an executive position in the Microsoft Business Solutions Group to the Search and Advertising Platform Group earlier this year, and Rick Devenuti, senior vice president of Microsoft Services and IT, who retired at the beginning of 2007. Replacing Devenuti in the lineup is Maria Martinez, corporate vice president for Worldwide Services. Her appearance will be closely watched by partners looking for any signs of a shift in the Microsoft Consulting and Services direction set by Devenuti and clarified during his keynote last year. Although the WPC was formed by combining general and MBS partner events, some Dynamics-focused partners don't find the WPC a perfect fit. Judy Thomas, vice president and chief operating officer of The TM Group Inc., a Microsoft Dynamics Gold Certified Partner based in Farmington Hills, Mich., won't be attending this year. "I've chosen to stick with Microsoft Convergence and the Partner Meeting in Fargo in the fall," Thomas says. "There's more content and it makes more sense for me on the Dynamics side of the world." The Microsoft Partner Program encompasses one of the most diverse channels in the IT industry. The sheer size of the Microsoft Worldwide Partner Conference -- 7,000 attendees last year -- raises the odds that you'll find someone to network with, even if your slice of the industry is the most specialized sliver. 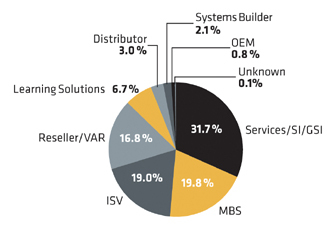 This graphic shows the types of partner companies that sent people to the 2006 WPC. Dynamics makes up one of the 15 session tracks and is augmented by the Reller keynote. In a general-session keynote, though, Microsoft must partially make the material relevant to infrastructure partners who might be considering a move into the Dynamics space. However, there's a one-day deep dive into Dynamics just before the conference starts. Called, "Amp Up Your Microsoft Dynamics Business," the all-day session takes place on Monday, July 9. The Dynamics session, like many pre-conference sessions, is also carried over from last year. Other Monday sessions include Microsoft Partner MS101, an Enterprise Partner Briefing, a Microsoft Learning Summit, a Windows Vista desktop deployment and management half-day session for partners serving enterprise and midmarket customers, hands-on labs and an Industry Partner Forum, which will focus on vertical strategies and issues. Also on Monday, Microsoft is holding its second annual Microsoft Small Business Symposium, a 12-hour marathon session for Small Business Specialists and other partners interested in that market. For Amy Luby, CEO of Mobitech, a managed services provider and Certified Partner in Omaha, Neb., that symposium is the main justification for sending three of her company's five employees to the WPC. "The Small Business Symposium makes it absolutely worth my time to be there," Luby says. In addition to networking with her peers and Microsoft contacts, Luby hopes to learn more about Microsoft's SMB plans. "Specifically, I want to know more about [Microsoft's] new VOIP solution, Home Server, System Center Essentials and Forefront," she says. Harry Brelsford, CEO of SMB Nation in Poulsbo, Wash., who helped advise Microsoft on the agenda for its symposium, hopes Microsoft will use part of the conference to lay out plans to help system builders and small OEMs become more business-savvy. "This segment of the market is changing very quickly," Brelsford says. In another pre-conference staple, the IAMCP will hold its invitational golf tournament on Sunday, July 8, at the Arrowhead Golf Club in Littleton, Colo. While networking on the golf course, at parties, in regional or industry lounges, in sessions or outside the keynote halls has tremendous value, Insource Technology Corp. gets a different kind of intangible benefit from sending three employees to the event, says Bill Breslin, sales director for the Houston-based Gold Certified Partner and president of the U.S. chapter of the IAMCP: "The additional benefit comes from the energy and excitement the Microsoft execs seem to infuse the partners with." While networking was the common denominator when we asked Microsoft channel partners why they were attending the Microsoft Worldwide Partner Conference (WPC), partners cited many other reasons to attend the WPC this year. Lesa George, director of consulting services with Ideaca Knowledge Services, a Dynamics VAR and Gold Certified Partner with offices in Calgary, Toronto and Vancouver, has a laundry list of intelligence to gather from the show. George wants to get information on Microsoft's new search line of business and understand how Microsoft is doing in that market segment; learn the business plan from the consulting services division and how it fits with partner consulting services; and see roadmaps for Dynamics, business intelligence, Information Worker and PerformancePoint. As if that's not enough to keep a person busy, George is also looking for more information on support programs on all products, and what developments are coming up in training. Douglas G. Hafford, vice president of consulting services for Afinety Inc. in Los Angeles, will also be combing the conference for product roadmap information. "Our main concerns revolve around the core product paths, and thus this is a particularly interesting year. Office 2007, [Windows] Vista and Exchange 2007, for example, are products we either do now, or will soon install every single day in our unique Fortress Networks. This crucial time, at the very start of their production life, is important to us as we enhance our own product offerings around them. How those products evolve and are supported by Microsoft and its development partners is a key part of our business strategy," Hafford says. Because the WPC is a worldwide conference, we asked some non-U.S.-based partners what makes the conference worth the extra time and trouble of an international trip. "It's an opportunity to meet with some international directors, to learn more about how to work with Microsoft on different programs and how other partners around the world are doing things with Microsoft and the Microsoft Partner Program," says Ulises Aguilar Nahle, director general of eNfinito, a Gold Certified Partner in Mexico focused on information worker and security solutions. Nahle also looks forward to the opportunity to talk to Microsoft about international issues. "I [would] like to see a Microsoft more integrated internally every time I attend, the same message worldwide and locally," Nahle says. "I would like to see how Microsoft [is] going to reinforce the message about through-partner marketing, working with the PAMs and the lead assignment tool." For Canadian partners, it's also a chance to scope out opportunities, according to John Payes, president of the Canada chapter of the International Association of Microsoft Certified Partners. "Canada is one of the largest subsidiaries that attends WPC from a partner perspective. Over 500 partners from across Canada attended last year. For Canadian partners, it's pivotal to connect with our U.S. peers, as most of our Canadian businesses view the [United States] as a great market to expand our businesses, and to connect with other markets internationally," says Payes, who is also director of the Microsoft Global Alliance for Nakisa Inc. Some international travelers find, surprisingly, that the WPC can be the best place to connect with their immediate neighbors. Angel L. Pérez, general manager of Rock Solid Technologies Inc. in San Juan, Puerto Rico, says, "It's funny. Sometimes it just happens that you don't talk to local partners that often because you're competing day-to-day. At the partner conference you have dinner together, because the PAM takes all of the partners to dinner together. Competitors can be collaborators. Many times you talk to them more there than here." As founder and CEO of SMB Nation, a small business training and consulting company based on Bainbridge Island, Wash., Harry Brelsford will have a lot of work to do at the conference. But network long enough, and business merges with the personal: "This will be my seventh year in a row. I now go to see people I know and make new friends!" Kevin Fream also will be networking, but with all the industry consolidation going on, he won't just be looking for opportunities to land joint deals. "I'm going to network with peers about the state of business and mergers/acquisitions," says Fream, president of Matrixforce Corp.
No matter what the reason for going, the conference-coverage strategy used by Bill Breslin's employer, Houston-based Insource Technology, may be a good one for any partner looking to get the most out of the conference. "Our folks generally stick with the keynotes and then with the business and sales tracks," Breslin says. "We thoroughly believe that partner revenues are made on the front-to-mid part of each product release lifecycle. We focus our internal service offerings around what Microsoft will be releasing in the next six-to-12 months, [so] the roadmaps are invaluable." By the way, partners interested in attending the Microsoft Worldwide Partner Conference 2007 in Denver need to get their tickets soon, by early June! See my related Blog post at http://rcpmag.com/blogs/weblog.aspx?blog=959.